In April, I ran for moderator on Stack Overflow and didn't make it through the primaries. That's ok though, there were several very good users that did get elected. In a surprise announcement, though, Stack Overflow is running a second election this year. This is the first time this has happened since 2011. I'm still interested in a position and I'm still active in the community, so I'm going to run again. This post will follow the process. Like last time, the nomination phase began with users throwing their hat into the ring. Nominations were slower and fewer this time. Only 19 nominees, so no one was eliminated due to low reputation. Several users from the last election are rerunning too. My platform hasn't changed much since the previous run. Below is my nomination post. This time, I tried to pull emphasis off the automated script by putting it lower on the list of things I've done and instead focused on the moderation tasks I do on Stack Overflow and the work I've done on Community Building. We'll see if it works. With this, I received my "candidate score". It was 33/40. Not the highest, but better than last time. The score wasn't mentioned in April. I am not expecting it to be an issue this time either. The primary phase is in the third day. In day 1, I was hovering around 9th/10th place. 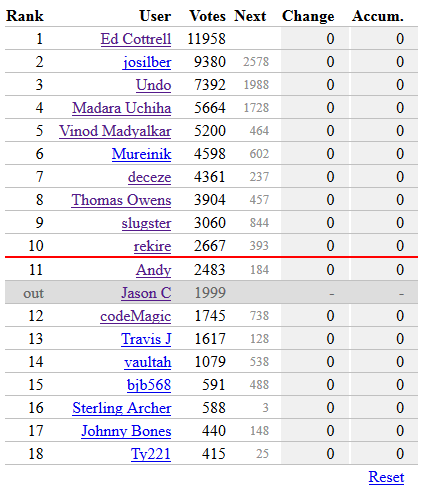 Overnight, between days 1 and 2 though, I dropped down to 11th. I've been sitting here consistantly for a full day now and, while still gaining votes, I'm not gaining as fast as 10th position. It appears I may not make the cutoff by Friday's deadline. While disappointing, there are a few things that I came away with that I'm very happy about. In the last primary, I revieved 1,492 positive votes. I've surpassed that already. I've over 2,100 currently. I'm pleased with that upswing. I was also more prepared for the questionnaire portion of the primaries this time. I've gotten the second highest number of upvotes on my responses. Several of the questions were similar to last time, but there are a few that I think should be included in the future elections. This first question is a great post for candidates. It allows them to show off their involvement in Meta and show their best work. For users, it gives them a sense of how a candidate interacts with the community. I am very surprised that several candidates list only one or two posts. This seems to be doing a disservice to themselves. This second question I struggled with for a bit. I've had ideas on how Stack Overflow/Stack Exchange could improve, but what did I want to present in this response. With the primaries over, I ended with 2483 positive votes. This put me in 11th place. Sadly, this was not enough to get into the election. I was 185 votes shy of over taking 10th. Good luck to the candidates that made it. One of the tools that came out of this election was a way to visualize various data points to compare candidates. I provided a couple notes about outliers various candidates show regarding aspects on the site. I found it interesting to see what each user had "specialized" in. I was closer to the top 10 this time, but still missed it. Even more surprising was that the user that ended up in 3rd in the primaries didn't even come close to getting elected. He was eliminated in the 5th round of final STV votes. I still think I'd make a great moderator for Stack Overflow, but I need to figure out the best way to promote myself in the next election.